The Myriad™ Rack Mount Modem Bank is an industrial grade, 19" 3U (5.25" H) chassis with slots for 18 modem cards and 2 power supply cards. Each modem card can be installed with any of Telenetics popular Pony Express™ modem modules, from Bell 202T to V.32 bis. Eighteen Modems slots are provided for front-loading, hot-swappable mixed modem cards. Each card can accommodate any one of the Telenetics (MD) modem cards listed in the table. Two power supply slots are provided. Power supply cards are available for any voltage in the range 9 - 15OVDC and 9 - 275VAC. A single power supply card will power all 18 modem cards. 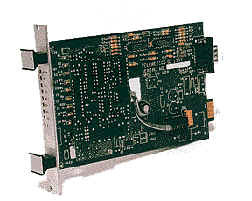 A second power supply card, if installed, provides automatic backup in the event of a failure of the primary power supply. The Myriad Rack Mount Modem Bank is an industrial grade, 19" 3U (5.25") chassis with slots for 18 modem cards and 2 power supply cards. Each modem card can be installed with any of Telenetics popular Pony Express modem modules, from Bell 202T to V.34. 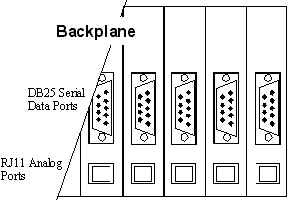 The backplane connectors are standard 0825 serial ports and RJ11 analog ports. Power connectors are screw terminals for DC and fused sockets (IEC 320) for AC. A Myriad (MD) modem card slides into any one of 18 Ws in the MR backplane and can be mixed in any combination of dial-up, leased-line or pilot-wire modems. MD cards can be removed while the rack is powered. Telenetics Myriad™ Rack Mount Modem Banks are used by most major manufactures of SCADA Master Station equipment and systems. Each 19" x 5.25" chassis can accommodate 2 power supply cards (main and back-up) and 18 modems. Modems can be dial or leased line, from Bell 202T (1200bps) to V.34 (28.8kbps).